Real Housewives of Beverly Hills star Kim Richards had a rough night last night, and the aftermath is going to be hellish for her. The celeb was arrested at the Beverly Hills Hotel after going on a rampage at the famed Polo Club. She refused to leave after making a huge, drunken scene, and when police arrived, things went from bad to worse. Richards, who reportedly reeked of alcohol, had to be dragged out of the bathroom by cops and when they finally got her to jail, she kicked an officer. She has been charged with public intoxication, trespassing, resisting an officer and battery on a police officer. Richards went to rehab in 2011 and claimed to have maintained her sobriety ever since, but that was called into question this season when she took a pain pill from her ex-husband and started exhibiting erratic behavior again. The latest incident is sure to drive the wedge further between the sisters, who were already feuding over a dog bite suffered by Kyle’s daughter at the hands — or rather teeth — of Kim’s dog. Richards was booked and released, and is due in Los Angeles Superior Court on June 10 to answer the charges. UPDATE April 17, 2015: A source told TMZ that some incredibly stressful circumstances drove Kim to fall off the wagon — her ex-husband, who still lives with her, is dying of stage 4 cancer, her son was hospitalized, she is under a great deal of financial stress because she is not receiving child support, and her daughter Brooke’s upcoming wedding has driven a further wedge between her and Kyle. 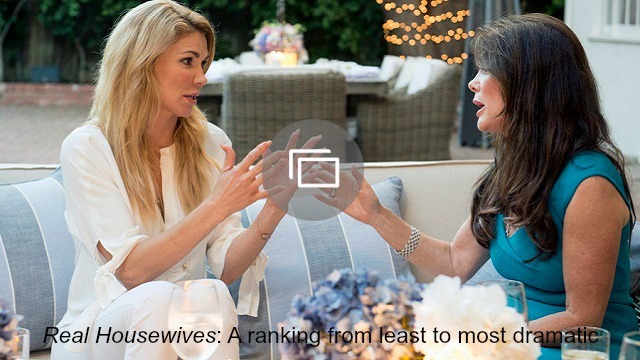 But the straw that broke the camel’s back was watching the three-part of RHOBH. The source said Kim avoided it during its first air, but she had to catch up to fulfill her contractual obligation to blog about it. Reliving everything that went down was just too much for her. Another source told RadarOnline that RHOBH producers have given Kim an ultimatum: “Producers are going to give Kim an ultimatum — go to rehab, or else!